This chapter revises the traditional analysis of the Jews of colonial Savannah, who first arrived in 1733 and constituted the first intentional Jewish community of North America. These Jews, most of whom descended from forced converts to Catholicism, have generally been appraised as free people indigenous to Portugal and Spain, as refugees from religious persecution, as largely ignorant of the British colony, and as either wealthy or relative newcomers to impoverishment, who embraced an opportunity to create a new experience for themselves as public Jews. 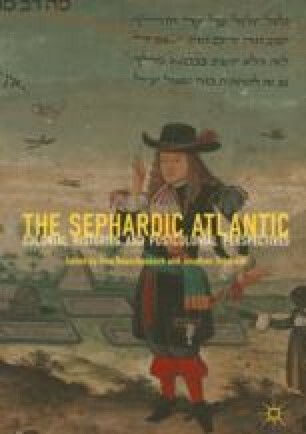 Based on the application of a transimperial Atlantic History approach, coupled with recently unearthed archival evidence, this chapter argues that Savannah’s Jews were quintessentially Atlantic Jews, to whom Portuguese Jewish heritage, slavery, poverty, and mobility were central. This enhanced understanding of Savannah’s Jews is achieved through a consideration of other more sizeable Atlantic Jewish communities that left behind a much richer archival legacy. My thanks to Sina Rauschenbach for her invitation to contribute to this volume and to her and Jonathan Schorsch for their keen editorial insights. Portions of this chapter, which have been abbreviated due to space constraints, are drawn from my unpublished presentation, “South and Further South: American Jewry and the Atlantic World,” Margolis Lecture on the Jewish Experience in the American South, Carolina Center for Jewish Studies, Duke University (November 2015), researched while a Loewenstein-Wiener Fellow at the American Jewish Archives Marcus Center (2015–2016). I would like to thank Ruth von Bernuth, Yaakov Ariel, and Rachel Ariel for the invitation to speak at Duke University, and Executive Director Gary Zola, the (now retired) Senior Archivist Kevin Proffitt, Managing Editor of Publications Dana Herman, and their colleagues at The Jacob Rader Marcus Center of the American Jewish Archives for their assistance. I am also grateful to Honorary Archivist Miriam Rodrigues-Pereira for permission to consult the Portuguese Jewish collection at the London Metropolitan Archives, and the staff of the below-mentioned archives. Abbreviations are as follows: AJA (American Jewish Archives, Cincinnati, Ohio); LMA (London Metropolitan Archives); NAN (Nationaal Archief Nederland); TNAUK (The National Archives of the United Kingdom); NPIGS (Nederlands Portugees-Israëlitische Gemeente, Suriname 1677–1906); SAA (Stadsarchief Amsterdam).